Teaching is tough. No two days are the same, which is also what makes our job the best. But, for real, it. is. tough. Legislation changes, new students in the middle of the year, a million and one meetings… the list goes on and on. 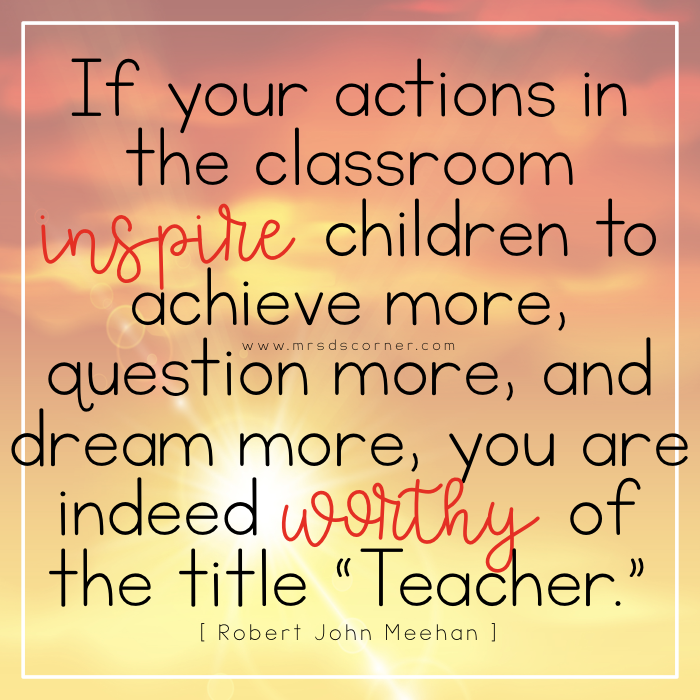 And I will be the first to admit that some mornings I struggle to get out of bed to do the one thing I love: teaching. I truly love teaching, and I know that you do too. But if you’re like me, which I’m guessing you are, you struggle with feeling like you are not enough as a teacher. Or maybe you give 110% at school and go home and struggle with emotions of also being a mom, a wife, a sister, an aunt… a regular person who has a life outside of teaching. As teachers, we often feel less than important, unsupported, and under-appreciated. It is okay to feel the way I feel. I am not alone. I believe in myself. I believe in my abilities as a teacher. I am always doing the best that I can. I am in the right place. I am meant to be a teacher. I am a competent and capable teacher. I am confident in my abilities. I am a valuable asset to my school, my district, and my community. I have a powerful gift. I have something important to share. I am a dedicated champion. I make my classroom great. My students make my classroom great. Together we make magic happen. I make a difference in my students’ lives. I see each student as an individual. I see each student for who they are and what they can do and who they can be. The work I do every single day matters. It is okay to stray from the lesson plan. I am flexible. I am creative. It is okay to have fun in school. It is okay for the kids to be kids. I love my students. My students love me. I am a better teacher because of my students. My students are better humans because of me. I make a positive difference in my students’ lives. I am important. And I matter. I am amazing, and I am prepared to succeed. Today was a day that I questioned my place, my value, and my future as a teacher. I opened your email and the first thing I read was that I am not alone. Thank you. I’m a firm believer that God shows us. Keep shining your light for all to see. Thank you for your honesty! I look at those of you who have the face book pages, and the blogs, and are admin. to the Sped Squad, as being THE perfect Special Ed. Teacher, so it’s really nice to hear you are struggling. You all seem to have it together!!!! I teach ECSE, and I have 10 students, with 11 coming soon, with 1 full time aide, and a floater for about 3 hours. I have 4 with severe behaviors, and when my assistants are taking my kids to inclusion, I am by myself with the neediest kids. To say I feel as if I am failing is an understatement. I am tired, frustrated, and angry at the system for putting my kids last. I have a wonderful principal, who understands the problem, and she is trying to get me another full time aide, so I’m praying for that miracle, because my kiddos desderve to have a better environment to learn in. Anyway, enough of my rant, and I seriously thank you for your honesty of your struggles, it is really good to hear. I am in my second year, this year I am teaching kindergarten and I am struggling in planning and executing lessons. I am off for a week, I just need to refocus. Lucky me…tomorrow is going to be my another first teaching day after a week of mid-semester break. Since morning I wish this day not ending so fast…I wish for extended holidays……….. 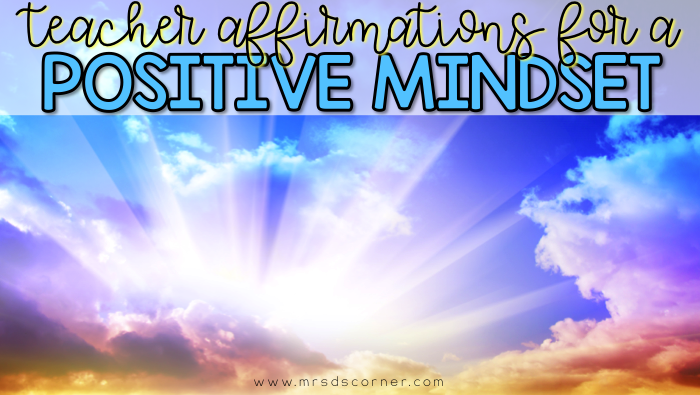 Fantastic affirmations. I think teachers can really benefit from these.